As a member of the prestigious group, First Weber Group recently attended Leading Real Estate Companies of the World Conference in Las Vegas where there were more than 2,000 attendees from over 20 countries. 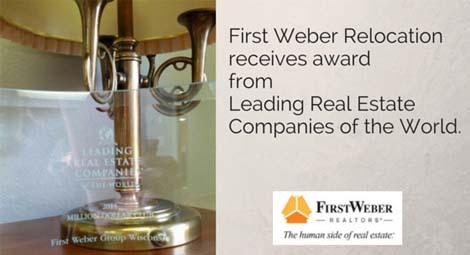 It was a high honor for First Weber to come home with the Leading RE “Million Dollar Award for Performance Excellence” in the category of Relocation, Outgoing Referral Closings in 2014. That’s a lot of outgoing referrals. Congratulations to the Relocation team at First Weber. First Weber sells real estate throughout Wisconsin: Metro Milwaukee and Southeastern WI, South Central Wisconsin/Greater Madison, Southwest Wisconsin, Central Wisconsin, Northeast Wisconsin and Wisconsin’s great Northwoods. Welcome to the First Weber Team. We make getting your Wisconsin real estate license easy. One more way First Weber Group is active in the communities we serve. Nice work, Reedsburg.